The term barbecue sauce has come to mean a sweet ketchup based sauce. There is nothing wrong with that kind of sauce, they are one of the main ingredients in Kansas City Ribs. However, there are so many different barbecue sauces from all over the world. There are mustard, white, vinegar, hoisin and many others. I was looking at the recipes at the Crosby’s Molasses site to find a cookie recipe. I have used molasses in my barbecue sauces over the years but the site got me thinking about giving the molasses a more prominent place in the flavour profile. I received further inspiration from a recent stir here in Canada. Heinz closed their plant in Canada to get lower paid workers elsewhere. 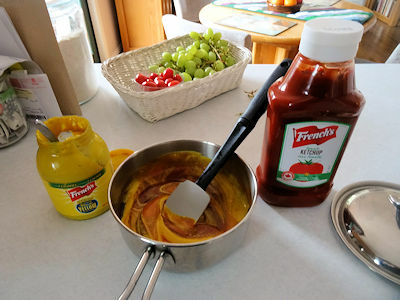 French’s has started making ketchup and in Canada with Canadian Tomatoes. I am now a French’s ketchup user. However, French’s is famous for mustard. Again, I have used mustard in barbecue sauce but I was thinking about giving it a larger part of the taste of the sauce. Not a Carolina Mustard sauce but a significant amount in the sauce. I pulled out a bowl and started mixing and tasting. When I was done, I put the sauce in a covered container in the fridge overnight to let the flavours marry. I am so proud of myself. I really like this sauce. First of all, you need to know this is not the bright red barbecue sauce you buy in the supermarket. It has a nice reddish mahogany colour. 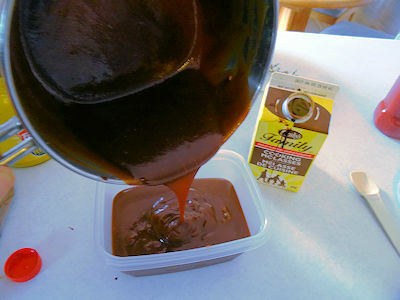 Unlike its store bought cousin that is sweetened with corn syrup, the molasses in this sauce gives it a much more complex sweetness that stays on your tongue longer. You know its quite sweet but it isn’t candy like. The mustard adds a different heat and the vinegar in it adds to the tomatoes and sweetness from the ketchup. It is a much sharper taste of mustard and it balances well with the molasses. When I cooked with it, it is still a very sweet base. It caramelized well on the meat and gave a great taste and texture. Take a chance. Step away from the supermarket barbecue sauce and try something different! Store, covered, in the fridge overnight. There’s nothing like a homemade sauce! YUM!! 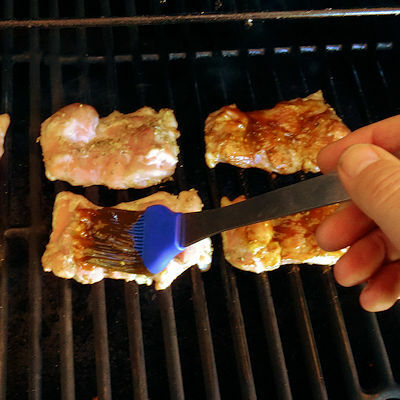 This is a must-make for grilling season! I do love grilling and smoking and I am so glad it is finally warming up. yum! We have been getting some more mustardy sauces lately but I have never tried making my own. We usually have these ingredients on hand too, which makes it extra nice! What I really like about making your own sauce is getting to meet your tastes. Intrigued by HP Sauce, had to google search it. Now off to research it a bit more and figure out the US equivalent. I do know a couple of people in the states who found it by hunting around. I’m proud of you too. Don’t know how I ever missed this one but it sure is a must try for me. I’ll have to look for HP sauce on my next visit to the store. Simple ingredients and easy to make!! I like it. Thanks, Sam! If you can’t find HP sauce just substitute your favourite steak sauce!